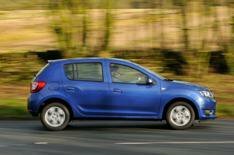 Dacia 'could build city car' | What Car? The Romanian brand, which is owned by Renault, has enjoyed startling growth in all of its markets with the Duster, Sandero, Sandero Stepway and Logan saloon. The oldest of those models, the Duster, is just three years old, so Dacia has the potential for a stable product line-up for at least three more years. However, Renault product chief Tom Lane has acknowledged that Dacia could look to expand its range into new areas in the future particularly because the firm faces a growing threat from rival budget brands, including one from the VW Group. Renault's current city car, the Twingo, is due for replacement next year. Lane confirmed that it has 'an interesting engineering and packaging solution', which is believed to be a rear-engined layout. That switch could potentially leave space for a cheap, conventional Dacia city car, with less rear space and boot capacity than the Sandero but, conceivably, a price tag from as little as 5000. Lane also confirmed that the Renault-Nissan Alliance is 'discussing' ways to share technology, parts and even manufacturing between Dacia and Nissan's forthcoming budget brand, Datsun.